However you slice it, this zucchini salad is an easy addition to any summer barbecue or picnic. Long, flat ribbons add a touch of elegance, but this recipe also works with summer squash cut into spirals or thin rounds. While the salad is great right after it's made, sitting in the dressing gives the zucchini time to marinate, getting more and more flavorful. It's also easy to customize—get inspired by the variations below. Rinse the zucchini clean and pat them dry. Cut the zucchini lengthwise in thin slices. If you have a kitchen mandoline, this is a great time to put it to use; if you don't, a sharp knife and a steady hand will do the job. Thin slices will be the most pleasing in the final salad, but even cuts are more important than the width. 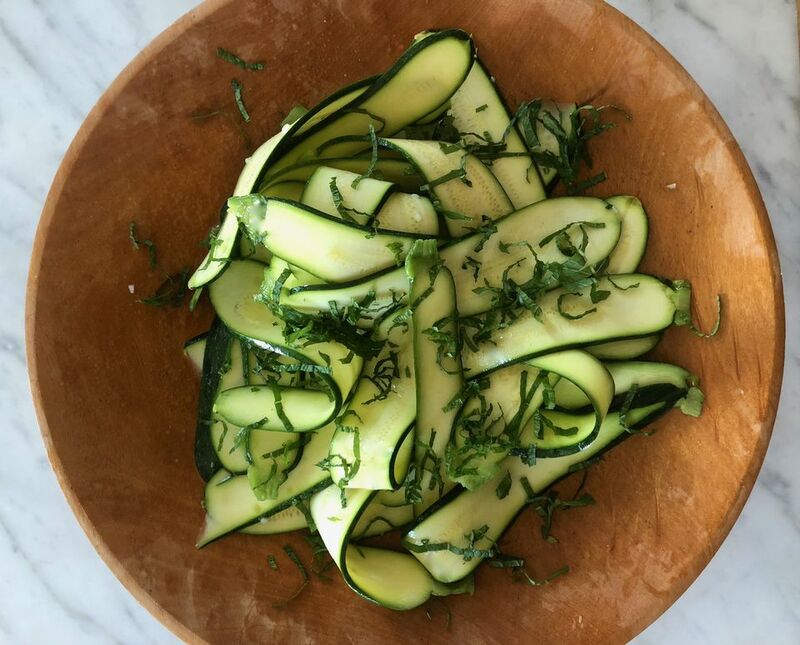 Put the zucchini slices in a colander and sprinkle them with the salt. Toss to distribute the salt evenly around the zucchini. Let sit for 30 minutes (this softens the zucchini slices and will make the zucchini less bitter, more pliable, and easier to eat). Rinse the zucchini with cool water. Dry on a clean kitchen towel or layers of paper towels—you want to air them out thoroughly. Set aside. Peel and mince the shallot. Put the minced shallot in the bottom of a large salad serving bowl. Add the lemon juice or white wine vinegar, mustard, pepper, and olive oil. Whisk to combine. Add the zucchini and toss to coat the slices evenly with the dressing. Taste and add salt, if needed. If using the mint: stack the mint leaves together, roll into a mini-cigar shape, and slice into thin ribbons (this is called a chiffonade). Sprinkle the mint on the zucchini. Add more freshly ground black pepper, if you like, and serve. Swap in garlic for the shallot—mince right before using (jarred garlic will add a bitter note to the dressing). Add 1/2 teaspoon freshly grated ginger to the dressing, along with a dash of soy sauce; use peanut or instead of olive oil and cilantro in place of the mint. Spice things up with a sprinkle of red chili flakes. Use a green onion or two instead of the shallot, lime juice instead of the lemon juice, and cilantro instead of the mint. Sub in 2 tablespoons of sesame oil (or 1 tablespoon toasted sesame oil) in place of the olive oil and sprinkle on white and black sesame seeds instead of the mint at the end.